Welcome to Douglas Good Photography! I have been a photographer for most of my life. My father gave me my first camera when I was six years old. He showed me the joy of capturing images of family and friends. My love of the sea began with family vacations to the Jersey shore. I spent countless hours bobbing in the surf, gazing into the depths through my facemask, and dreaming of swimming with all the sea life I saw below me. When I told my father that I wanted to learn to SCUBA dive, he told me stories of fishing trips where sharks circled his boat. Those stories of course were intended to discourage me from pursuing that thought any further. I did learn to dive as a college student, and from my very first dive I wanted to capture photos of the magnificent creatures I encountered. The pages of Skin Diving magazine revealed images by Jim and Cathy Church that were just like what I saw, and I knew immediately that I would pursue underwater photography instruction with them. Jim was my mentor for many years, and became a dear friend. 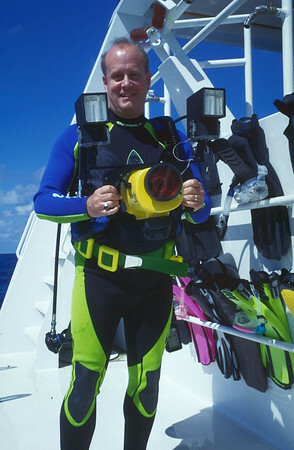 I owe most of what I know about capturing underwater images to his expert instruction, his ability to share creative insights, and many hours spent patiently by my side sharing techniques and photo subjects. Jim loved to teach, and he loved to share his knowledge with others. I will be forever in his debt. The Jim Church School of Digital Underwater Photography lives on through his two very talented former students, Mike Mesgleski and Mike Haber. I highly recommend them to anyone desiring to learn underwater photography! It is my hope that these images inspire you! If you have questions about any of the images in this print gallery, use the contact form on the main menu. I am very pleased to announce that I have published my first ever photo book entitled "Sea Secrets"! Click on this order my book link to go to the Blurb Bookstore and preview my book! If you choose to purchase a copy, please know that all proceeds - $5 per book - go directly to the Samaritan Counseling Center in Lancaster PA.